So what makes for an “insane payrise”? Let’s first look at the definition of insanity. A common definition, albeit probably not the dictionary definition, is doing the same thing in the same way and expecting a different outcome. Interestingly, the majority of times someone receives a payrise within 3 months or so they see no tangible benefit of receiving an increase pay. They think it will make a difference before they receive the increased income, but such a prediction fails to materialise into any real change. Then the next performance and pay review comes around, the negotiation for a payrise takes place, usually under a certain level of anxiety for all parties, and then 3 months later, the same thing happens, there is no noticeable change or benefit reaped. This represents not only an insane payrise pattern on an individual level, but an insane pattern on a collective level. This behavioural pattern is costly to the financial position of both the employee and employer, and is costly to the relationship between the employer and employee. There is one of two ways to respond to this pattern. The first is to ignore it. The second is to understand where this behaviour comes from, and then do something about it. Taking the first approach needs no further discussion. Taking the second approach, that is, to do something about it, does require further exploration. When understanding behavioural patterns and personal financial management, it is important to understand what motivates us around money. First of all, we have the ego-self which sees money as a tool to grow self-worth. Secondly, there is the strategic-self which sees money as a resource to fund a desired lifestyle both in the present and into the future. When bidding for a pay rise, it is important to understand whether it is the ego-self or strategic-self playing the dominant role. 5. Because the boss must be making more money this year. The ego driven payrise helps us feel ‘good’ about ourselves, but it does little to provide genuine lasting financial benefit. It is important to highlight there is nothing wrong with approaching a payrise through the ego, many of us do it, have done it, and will do it. However, when the ego-self is the driver, the focus is on getting a payrise, not what can be done with additional income, leaving the strategic-self sitting in the shadows. What is being highlighted here is if you want to go beyond this pattern of “not enough – need more – not enough – need more”, to finally arrive at the harmonious place of genuine pay satisfaction, the next time you look for a payrise, put the ego to the side, and encourage your strategic self to be the dominant player. The strategic self does not hang one’s self worth on receiving a payrise or not. The strategic self is rather emotionless about how much money it earns or doesn’t earn. The strategic self is more interested in what it can do with what it earns, as opposed to just getting more. When the strategic self is dominant, a different approach leads up to the payrise, which increases the likelihood of different outcomes and actions once the income has increased. It is only through taking such an approach that the pattern of insane payrise management can be broken. Before the next pay review, put the ego to the side and employ your strategic side. Some people can do this more readily, depending on your money personality preference; however, we can all do it. Strategic consideration 1: Are there reasonable grounds to expect a payrise? If the organisation has had a difficult time of it, there may simply be a lack of financial resources to increase wages. Depending on your role, you may feel that this is out of your control. Nonetheless, being empathetic around organisational realities is an important first step. On the other hand, if the organisation seems to be going well, and your contribution quality and/or quantity has at least been stable, and preferably has grown, then there is every reason to discuss the merits of a payrise. Strategic consideration 2: What will you do with increased pay? Using a payrise to fund a short term interest, such as a weekend away may sound great, but it will lead to pay dissatisfaction approximately 2-3 days after returning from your getaway. From a satisfaction perspective, you are better off funding holidays through savings rather than one-off kickers like a jump in income. This is a similar concept to buying the plasma TV with the baby bonus. Soon enough the plasma means little, and the money is gone. If you really want to make the most of your payrise, get clear on what you can do with the money on a regular basis, which provides medium and long term gains. 6. Use the higher income to take out a loan to purchase other investments. Just be careful of gearing strategies as risk is typically increased, particularly with double gearing. There are certainly other pro-active, strategic considerations that can be made prior to getting your next payrise. Consideration 3: Do your calculations! Remember that an increase in pay is typically expressed as gross income. You will need to take out income tax to determine how much you have to work with from pay to pay. (Unless you salary sacrifice your gross income increase straight to superannuation). To determine your increased after-tax income, you can use the Income Tax Calculator. While doing this, you may also like to complete the Budget Calculator to see if any money is slipping through your fingers. You may find that you run a pretty tight ship, but you may also find that you could further increase mortgage payments or the amounts you regularly send to investments. Employers benefit from employees who look after their finances, at least to the point that they are not financially stressed. Employers typically want their employees to be satisfied with their pay, but the reality is, what you do with your pay is your choice, and these choices drive pay satisfaction more so than what your employer can do. 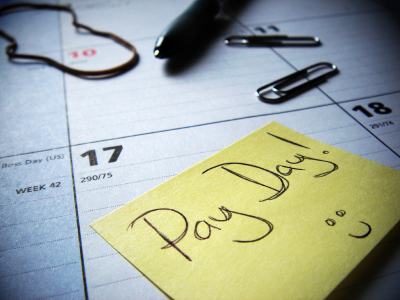 Be open with your employer or manager about what you would like to achieve through a payrise. They may be able to assist in ways you were previously unaware of. Having such a discussion may also help you genuinely reap the benefits of increased pay. By employing the strategic-self, and putting the ego-self on the shelf, the potential conflict and anxiety around pay review reduces. This doesn’t mean you become a jelly blubber when discussing performance and pay, it just means you are not hanging your self-worth on what you get paid. By taking a more strategic approach, considering both the plight of the organisation, as well as your own needs and opportunities, you enable a more harmonious and balanced conversation to be held, and you also increase the likelihood that a noticeable difference is achieved as a result of the increased income. Remember, that the relationship between you and your employer is one of interdependency. The more it grows, the more scope for you to benefit, and the more you grow, the more scope for the organisation to benefit. As the saying goes, “it takes two to tango”. By using the tips outlined in this article, you increase your likelihood of “doing well” financially, being engaged in your work, minimising financial stress, while supporting the collective performance of the organisation.